What is different with this budget proposal is that the Appropriations committee is no longer attempting to craft bipartisan packages, thanks to the old switcheroo that was pulled off against Democratic committee members last month. Fool me once, shame on you and all that. As appears to have been Speaker Nutting’s decision, they’re going for a partisan budget and the package passed out of Appropriations on a partisan vote includes substantial cuts to MaineCare. Now, what has never made sense to me is that the parts of the state which vote most reliably Republican are also the poorer parts of the state, most dependent on different kinds of transfer payments from the state and federal governments. This is also true of MaineCare. The most reliably Republican parts of the state are the parts of the state with the highest proportion of MaineCare spending per capita. To illustrate the degree to which this is the case, I made you some maps. I used the federal account of the percentage of total MaineCare spending in 2010 that went to each county and then divided that by the percentage of the state’s population living in each county. The deeper red the county is, the higher the proportion of MaineCare spending per capita. In 2010, Washington County contained about 2.5% of Maine’s population but accounted for 4.7% of MaineCare spending. This was the most extreme case, but all counties colored in red contained a lower share of Maine’s population than they claimed in 2010 MaineCare spending. 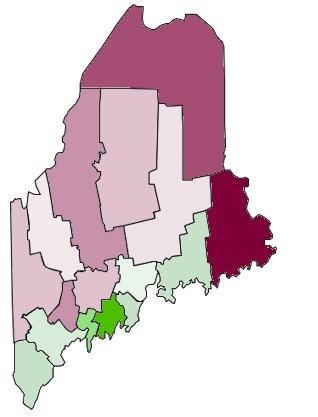 Meanwhile, counties colored in green received a percentage of MaineCare spending that was lower than their percentage of Maine’s population. Like Washington County, Lincoln County represented about 2.6% of Maine’s population – unlike Washington County, however, Lincoln County received only about 1.7% of the state’s 2010 MaineCare spending. The map here on the right, meanwhile, is the map I made of county votes on the 2011 election-day voter registration referendum. Any county shaded in red opposed the referendum to restore election-day voter registration in higher than average amounts while counties shaded in blue/green supported the restoration of election-day voter registration in higher than average amounts. I can also tell you that votes opposing the referendum tracked extremely closely with support for Paul LePage in 2010. The trend described in these maps is familiar to anyone who spends any time studying Maine. It’s what we call the “Two Maines” phenomenon: Maine has a wealthier — and more politically liberal — south and a poorer — and more politically conservative — north. However, it is particularly relevant to think about this in connection with MaineCare. Do the good people of Washington and Aroostook County support kicking their 19 and 20 year old sons and daughters off of MaineCare? Do they view this service as having the same moral dimensions as the clearly perjorative “welfare”? What does it mean to deny state-supported health care to the disproportionately impoverished young people of northern and western Maine? Doesn’t this count as voting against your constituents’ interests? To me it seems that way, but I am so clearly not the target audience for this move I feel I can’t even tell you how it would be received. At the same time, there is another possibility. The decision to reduce the MaineCare rolls by removing previously eligible folks appears on its face to violate the Maintenance of Effort provision of the Affordable Care Act (a.k.a. “Obamacare”.) Gerald Weinand documents precisely why it is unlikely that Maine will get a waiver from this provision. This means that although the Maine legislature could approve this budget, the federal government is likely to require Maine to reinstate the people who were cut. If legislators essentially know that their constituents will not feel the sting of being cut off from MaineCare, but that they will nonetheless be able to share in the Republican glory of having “cut welfare” – if it weren’t for that meddling federal government with its unconstitutional Obamacare, that is – then they will be in the enviable position of having their cake and eating it too. * Now, there is no true, official definition of “welfare.” What is indisputable is that tagging a program with the “welfare” label is an excellent way to get people to see it in a negative light. I demonstrate this particular effect every year in my teaching, by asking students to respond to the question “Do we spend too much, about the right amount, or too little on assistance to the poor in this country?” and then asking them “Do we spend too much, about the right amount, or too little on welfare in this country?” Even asking these questions one right after the other during a lesson I have explicitly told them is on issue framing, the “welfare” label never fails to elicit more negative responses.